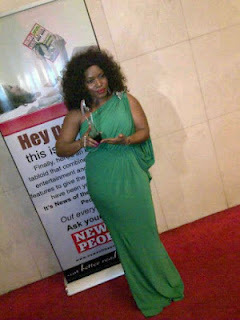 Always upping her game and expanding her brand, Halima Abubakar seem not to be resting on her laurels any time soon,rather she is breaking new grounds and soaring high like an eagle .Halima on Sunday 18th march 2012 added another feather to her cap when she emerged the Best English actress of the year at THE EMINENT AWARD 2012 powered by NEWS OF THE PEOPLE magazine held at Sheraton Hotel I, Ikeja.Lagos. 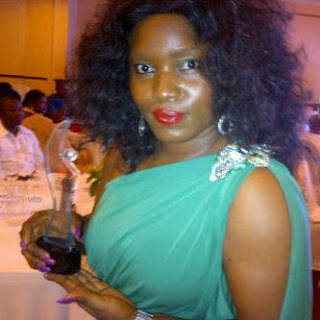 Halima who just got back from a business trip to South Africa was clearly full of surprises when she clinched the award. Clad in a 1500 dollars green outfit by Zuhair Murad, the limited edition. Halima ‘s sights is set towards achieving greatness in her craft. And like an excellently written movie script,she is acting out her life’s passion being the superstar in her life’s movie. Congrats! !